The Summer Farms Stands are open for the summer! 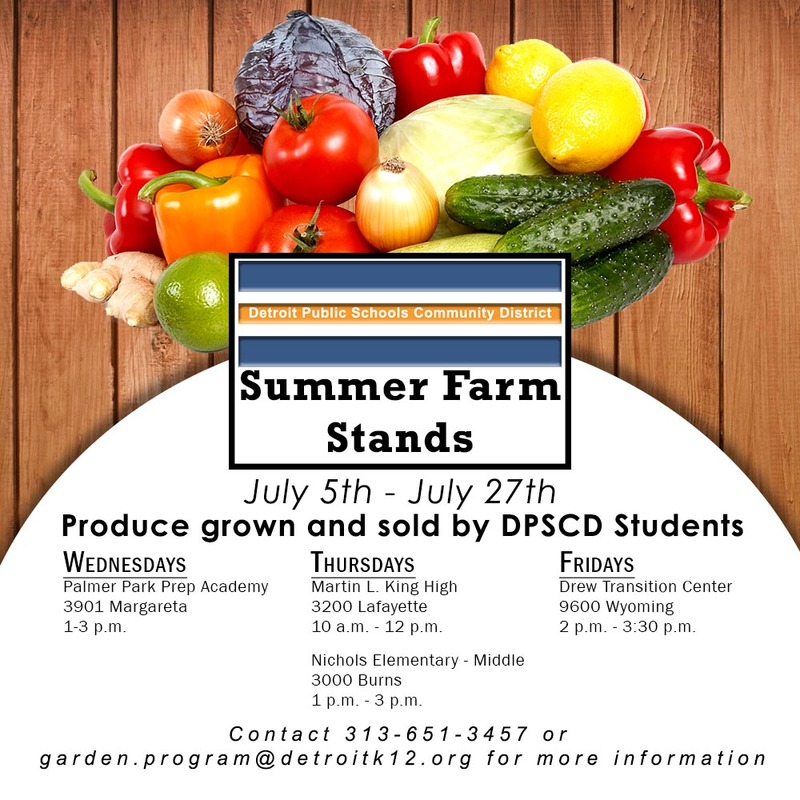 DPSCD’s Office of School Nutrition (OSN) and its Detroit School Garden Collaborative (DSGC) opened eight farmer’s markets on July 5. All produce grown at Drew Farm follows DPSCD organic growing practices (i.e. no pesticides). Water and the soil has been tested and cleared for safe growing. All produce sold will be labeled as unwashed in accordance with food safety regulations. All markets will accept cash, credit, debit and EBT/Bridge cards. 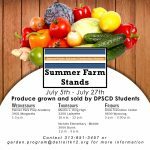 DPSCD high school students trained through the DSGC’s farm stand curriculum will assist in operating the markets. After reviewing more than 60 applications and interviewing 25 outstanding DPSCD students, OSN welcomed the following DPSCD high school students to participate in our Farm to School Youth Employment Program this summer! Students will be trained in urban agriculture, garden maintenance, and entrepreneurial farm stand management. Their training sites will be Drew Farm (located at Drew Transition Center), DPSCD’s 70+ school gardens, Mackenzie Farm, Catherine Ferguson (Chaney) farm site, and our DPSCD farm stand sites (schedule attached- including Eastern Market!). Thanks to our partnership with Drew Transition Center, these high school students will also be working collaboratively on a regular basis with our district’s exceptional students with special needs. Wednesdays: Palmer Park Preparatory Academy – 1:00 – 3:00 p.m.
Thursdays: Martin Luther King, Jr. High School – 10:00 a.m. – 12:00 p.m.
& Nichols Elementary-Middle School – 1:00 – 3:00 p.m.
Fridays: Drew Transition Center – 2:00 – 3:30 p.m.
Saturdays: Market on the Ave – 12:00 – 5:00 p.m.
Tuesdays: Eastern Market – 10:00 a.m. – 2:00 p.m.
Wednesdays: Islandview Farmer’s Market – 4:00 – 7:00 p.m.
Thursdays: NW Detroit Farmer’s Market – 4:00 – 8:00 p.m.
“This is a wonderful opportunity for students to take on leadership roles and make a positive impact in the community and provide access to healthy foods,” stated Monica DeGarmo, program manager of the Detroit School Garden Collaborative. The Detroit School Garden Collaborative is a Farm to School initiative comprised of Drew Farm, a two-acre farm and 82 school garden sites. Each site features six raised garden beds. Drew Farm consists of six, 96 square foot hoop houses which produces thousands of pounds of various greens, root vegetables, non-GMO sweet corn, tomatoes, cucumbers and other produce.